On my previous visit to Southworth’s gravesite, I had been struck by the incredible modesty of the headstone, a simple marker giving no indication that this was the final resting place of one of the best-selling American authors of the nineteenth century and one of Georgetown’s biggest celebrities and leading citizens. 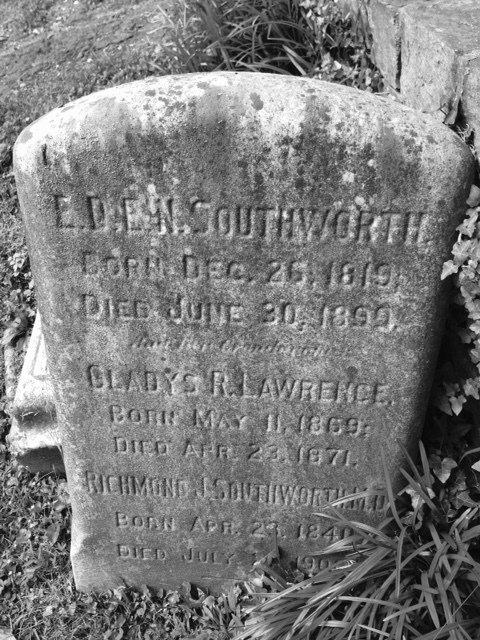 Indeed, her name is carved on the stone along with the names of Southworth’s granddaughter, Gladys Lawrence, who had died as an infant in 1871, and her son Richmond, who died in 1900, the year after Southworth died. I’m very curious to know the story behind this modest marker, so very different than the gravestones–of eminent citizens and many “nobodies”–surrounding Southworth’s in the cemetery. Why did her children and friends not opt for a more grandiose memorial for her, one that made note of her phenomenal career and incredible life? 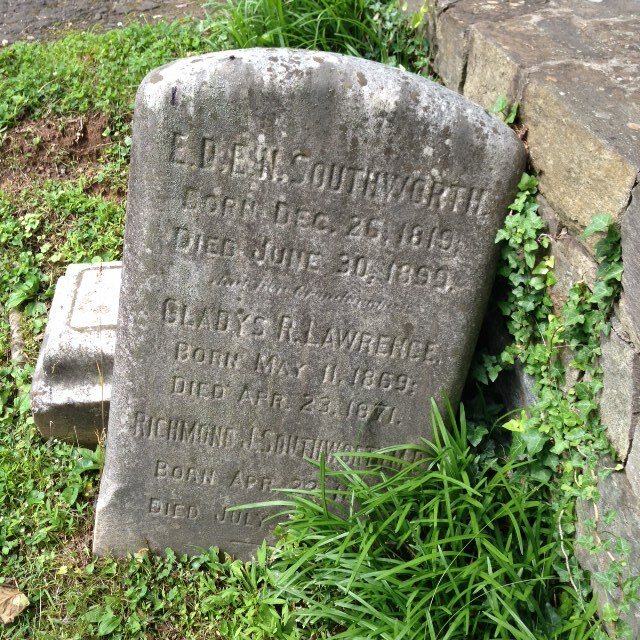 Was the choice for a simple marker and a burial in the plot that already contained the granddaughter Southworth’s decision or her children’s? As a scholar of her life and work, this truly seems insufficient as a commemoration of her status as author and citizen of Georgetown. To make matters worse, in the time since my previous visit, the gravestone has been knocked off its pedestal and it now leans against the pedestal and the nearby rock wall, with the tall grass growing up around it obscuring Richmond’s name and dates. It certainly is saddening to see the state of the grave and the neglect that the monument has received. While I’m pleased that the cemetery highlights Southworth’s in its map of prominent graves, it certainly seems Georgetown could do much better by her. How nice to find your blog. My wife has a collection of about 115 Southworth’s novels. Some are from England where story titles were changed and we continue to search for a few we are missing. We have compiled a list of her books but as you have noted, it is a daunting task. Please contact me if you are interested in our list.